Blepharitis is an inflammation of the eyelids. Affecting people of all ages, blepharitis tends to occur more often in people with oily skin. It is classified into two types: anterior and posterior. Anterior blepharitis affects the outside of the eyelid where the eyelashes attach. Anterior blepharitis can occur as seborrheic or ulcerative. Seborrheic blepharitis is associated with dandruff. 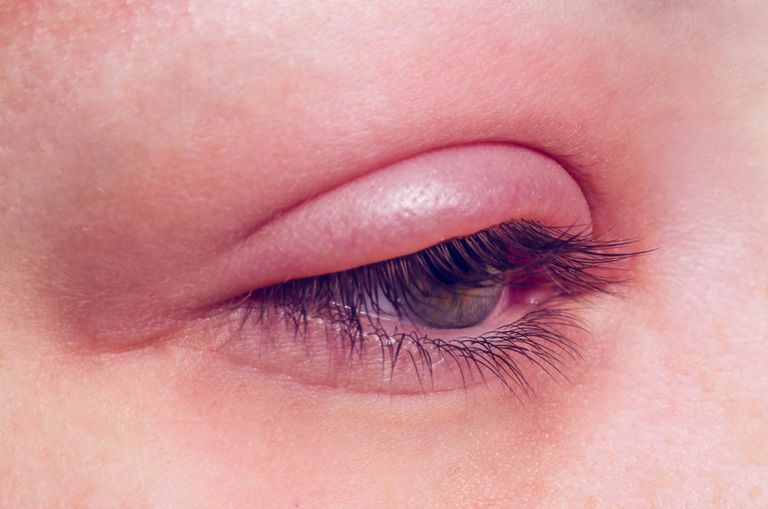 This type typically causes the eyelids to become red and produces waxy scales to build up on the eyelashes, causing the eyes to itch. The scales initially develop due to an abnormal amount and type of tear film being produced by the glands of the eyelids. Ulcerative blepharitis is less common than seborrheic blepharitis, and usually, begins in childhood. It is caused by bacteria. Ulcerative blepharitis is a more severe form that causes hard crusts to form around the eyelashes. These crusts often become matted during sleep, making it difficult to open the eyes in the morning. Posterior blepharitis develops when oil glands in the inner eyelid allow bacteria to grow. It can occur as a result of skin conditions such as acne rosacea and scalp dandruff. Posterior blepharitis is also referred to as meibomian gland dysfunction. Meibomian gland dysfunction, also referred to as MGD, is a much more common type of blepharitis. Meibomian glands function to secrete a type of oil. With the force of the blink, oil is secreted into the tears. This oil is designed to prevent tear film evaporation. When these glands have inflammation, either too much or too little oil is secreted. Patients with MGD often complain of red, burning eyes or dry eyes. Vision tends to fluctuate because the tear film is unstable. Blepharitis is usually a chronic condition so things people can do at home help resolve symptoms. Blepharitis is treated often by applying warm compresses with a very warm washcloth followed by eyelid scrubs. Eyelid scrubs can be done in several different ways. In the past, doctors recommended using baby shampoo with a warm washcloth. The eye is closed and scrubbed with the washcloth using a gentle back and forth motion. Baby shampoo is recommended because it does not sting your eyes. Omega-3 fatty acids are shown to stabilize the meibomian glands and create an anti-inflammatory effect on the eye. It may take 3 to 6 months before a definite beneficial effect is seen. Check with your doctor before taking any extra supplements especially if you have any other medical problems. This may sound silly but it is the action of blinking that causes the expression of the oil in the meibomian glands. However, as we concentrate when we read, use the computer or any digital device, we tend not to blink as often. Our blink rate actually decreases with age also. So, think about it. Four times per day, blink hard 20 to 30 times. Home care may not be enough. Medicine may need to be prescribed. Azithromycin is available in a topical form called Azasite. Doctors will often tell patients to apply a small amount of Azasite to the eyelid margin with their finger at bedtime. Azasite tends to have an anti-inflammatory effect as well as anti-infective. Antibiotic ointments, such as erythromycin and bacitracin, are also prescribed although they are a little thicker. For stubborn cases, oral antibiotics may also be prescribed. Oral tetracycline, minocycline, or doxycycline prescribed anywhere from 30 days to much longer can be quite effective. This is helpful especially for patients with a more severe form of blepharitis called ocular rosacea. Although steroids can bring unwanted side effects and risks, they are very effective at quelling inflammation when more traditional methods do not work. Doctors will prescribe them for blepharitis for short-term inflammation control to minimize potential complications. Lavine, Jay B., MD. The Eye Care Source Book. Contemporary Books, 2001. What Does Rosacea of the Eye Look Like? Are You Showing Signs of Eye Mites or Demodex?